I am Suk Bahadur Ghale who was born in the northern part of Kathmandu on the lap of mount Ganesh Himal. I spent my childhood days in Kathmandu staying in Boarding Schools Hostel. I completed my intermediated education in Management. I step in the field of tourism in 2009 working as volunteers in one of the INGOs (HHC) and in 2014 I got my trekking guide licensed from Nepal government organized by TAAN. 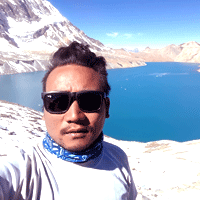 As trekking is my passion, I have been enjoying it going in the different Nepali famous trekking trails. I have been working in Nepal Wilderness trekking agency since five years, and I honestly welcome all our valuable clients from all over the world to join with us in Nepal Wilderness Trekking to make your trip in Nepal lifetime memorable.